Below are the recipes of various things made during the Summer Blending demonstration. Thank you to everyone that came—it was a fun evening and the feedback we received so far has been really encouraging. We hope everyone got to taste most of the things that were made—we had only accounted for about 20 people but around 40 turned up! If you have any questions about the evening please contact us. 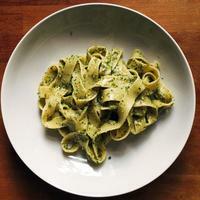 The recipes demonstrated are just ideas for you to start thinking of different ways in which you can use a blender. It is by no means a definitive guide or the only way of doing them. It’s not necessary to use a VitaMix like I did to make most of the recipes. You could use something like a £50 Philips HR2162/91 Viva Collection Blender—it has variable speeds. It will not make super smooth things but then there is a big price difference between the Philips and a VitaMix. It’s a good blender to start with. Remember if you do use a VitaMix the blades spin at a very high speed and things can get hot inside the container, so don’t blend for too long or use produce that has been chilled first. Do use a tamper if your blender comes with one. They can be very useful in getting the blend process started. The reference to speeds I make are for the VitaMix so adjust accordingly. Don’t overfill the blender, otherwise you could damage it—especially when you make things like ice cream or harder produce. A silicone spatula is really useful for scraping the insides of the blender. After using your blender wash it immediately! It’s a pain to clean once things start to dry up. It’s so much easier to wash the blender when it’s wet. One of the easiest ways to clean it is to half fill with water, add a few drops of washing liquid and spin for 30 seconds, discard the liquid and rinse. Wash all your fresh produce first. Use a chopping board and a good knife. 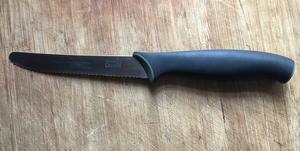 The knife I use is a Kitchen Devils tomato knife. It’s a great all round knife! If you are concerned about whether to eat organic or not—have a look at the The Dirty Dozen & Clean Fifteen. All the organic fresh produce I buy: salads, carrots, spinach, apples, bananas. Everything else can be a mix of organic and non-organic. I tend to buy mainly seasonal fresh produce with the exception of mangoes which I tend to buy all year round. Places I shop in Leicester: Leicester Market, Wholefood Coop, local ethnic food shops and sometimes supermarkets. Add sesame seeds to a blender and blend at speed 7 until sesame seeds have been crushed. Add dates and blend at mximum speed 4 until dates are well incorporated into the mixture. This part should not take long, otherwise you’ll end up making a sticky mixture. 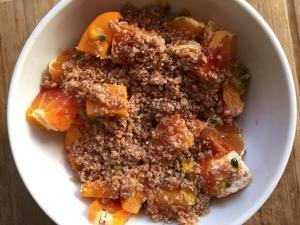 You can eat this crumble mixture as is or add it to some fruit and yogurt. The way I use it is to cut some seasonal fruit, make a thick almond milk/cream (see below), add the sesame date crumble and coconut strips. Mix well and serve—preferably at room temperature. Will keep for two to three weeks in the fridge. Add water, almonds to blender - blend until smooth. 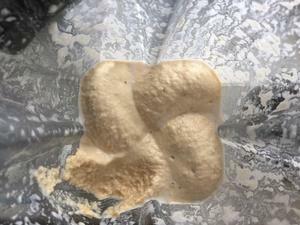 Put mixture in a nut milk bag (you can buy these from Lake Land and Amazon), and strain into a bowl or jug. Add vanilla and dates to almond milk and blend brieﬂy. Will keep for a few days. Add sesame seeds, water, lemon juice, garlic and salt into a blender - blend until mixed well. Add chick peas and blend—for a coarse texture blend at speed 7 for a short while and for a smoother texture blend at speed 7 for longer. The hummus will keep for 5 to 7 days. Best eaten at room temperature. This hummus is so yummy, easy and cheap to make—there is no excuse for not making it! It tastes better than the one’s you buy from shops. Another big plus—it’s an oil free recipe. It will keep for five to seven days in the fridge. 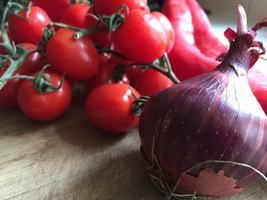 Roughly chop one cup of tomatoes place in a blender and blend at high speed until smooth. Set aside (optional-you can strain it to make it even smoother). Chop everything else and place into the large bowl. Add the seasoning and chopped basil leaves. Pour the tomato juice over all the other ingredients and mix well. Leave this mixture to marinate for a few hours or overnight in the fridge. Place the mixture and blend at high speed until smooth. 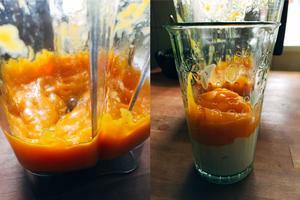 Add a few small pieces of mango to the bottom of the blender and then larger pieces. Start to blend at low speed and then gradually move it to the highest setting and blend until you achieve a smooth consistency. Drink immediately for maximum taste. It will keep in the fridge but the taste will change and also it will be cold—I think you should consume fruit at room temperature. If you wanted to make a green smoothie just add a handful of spinach or kale. There is no need to put anymore than that. Cut the watermelon into chunks with seeds. Place into blender and blend at a very low speed - 1 or 2. Strain the blended mixture through a colander—make sure the holes are not too big or small. A sieve will not work. You can use the juice as a base to blend with fresh mango. Soak buckwheat and walnuts in water for one hour minimum and preferably overnight. Add coconut, bananas, water into the blender and blend until everything is mixed well. Add cayenne pepper, lime juice, dates, spinach and the buckwheat/walnuts after rinsing them in water. Blend the mixture until a creamy mixture is achieved-you may need to use a tamper. 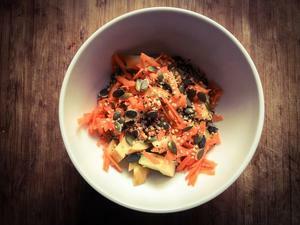 Spoon half the mixture into a bowl, add apple/carrots and top with pumpkin/hemp seeds - eat immediately. Not many people wanted to try this! When you did, you were pleasantly surprised by how much you liked it. Just make it once and try. Soak the dates for four to six hours. Strain the water from the dates. Keep the water. Place the dates into the blender and blend until you achieve a smooth consistency. You may need to use a tamper to help mix the dates. If the mixture is too thick to start the blending process, add a couple of tablespoons of the water that you saved. Spoon the mixture into a glass jar and keep in a refrigerator. The date paste will keep for up to three weeks. 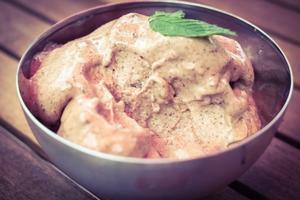 Take the frozen bananas out of the freezer five minutes before use. 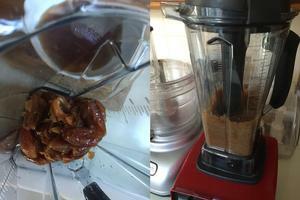 Put the bananas and cinnamon (optional: dates/cacao powder) in a food processor and process until soft and you get mounds forming. You will need to use the tamper or if you don’t have a tamper use more plant milk. Eat straightaway. 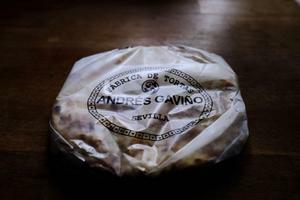 You cannot freeze this and then eat it later!